The poem is currently being workshopped (the 'last post' date being recent). The poem has not been sent to IBPC previously by MM. 2. Nominations must be posted as 'new topics' in this IBPC forum. The topic title(s) should include the title of poem and the author. The title description(s) should read: "IBPC Nom for X" where 'x' is the forthcoming month. 3. Copy/paste the content of the poem into the new topic (in the IBPC Nomination forum) OR if you wish, you may simply provide a link to the thread itself. Please include the name of the member and poem in your nomination thread. As an added feature, you may also utilize the 'report this post' button/link while you are in the thread you'd like to nominate. State in your comments that the 'report' is an IBPC Nomination. Please note this is an EXCEPTION only. 4. 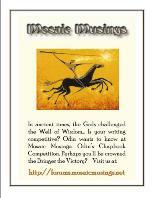 Poems can be nominated from our two workshopping forums: Herme's Homilies and Seren's Synapse. Also included for nomination is our adult works forum, Shambhalan Sanctuary. 5. Poetry must be the original composition of the submitter and may not have been published, either in print form or via electronic media. For this competition, published means any form of reproduction for which the writer received payment, either monetary or in kind. Poems which have been awarded prizes in other competitions are also ineligible, except school competitions, etc. 6. Once a member has accepted a nomination for that month's competition, any further poems nominated and accepted by that same member will be deferred to the following month. 7. Nominations will be accepted through the 20th of each month. Topics posted after the 20th will be rolled over to the following month. The work is the original composition of the poet. The work has not been previously published. The work has not been nominated by another participating board. The work has been reviewed as "best and final" to assure the latest revision is judged. The email address on file is up to date. *Note: We must provide the author's real name and email address with the nominations, so please make sure your profile information is up to date. If we cannot reach you, your nomination will be null and void. Obtain permission to submit the work (if selected to represent MM). Obtain author's real name (per IBPC rules). By all means, please post a reply to accept or decline the nomination. 1. Once a nomination is posted, we encourage members to add commentary to either the nomination thread or the original thread. If we are unable to reach the nominees as stated above in the nomination confirmation process, another work will be selected for the polling process. 2. All poems remain the property of the author. By having a poem entered, the author may also be eligible for the publication of the poem by the InterBoard Poetry Competition. 3. There is no entry fee for the IBPC competitions. 1. Each month, a POLL will be posted in the IBPC forum, which will count as 50% of the total votes. We ask that you choose the poem that you feel best represents Mosaic Musings while taking into consideration originality, creative imagination, characterization, artistic quality, technical merit, and the adherence to line limits. In a separate poll, the staff will vote for their top 3 choices, accounting for the remaining 50%. The results of both polls will be combined. 2. The top two poems (based on total cumulative votes) will be chosen to represent MM. 3. In the event of a tie in any of the top two spots, a second POLL containing only those poems will be voted on by our staff. All decisions of the judges are final. 4. The polling will take place between the 21st and the 28th of each month. Each month, the IBPC will award prizes of 1st, 2nd and 3rd place and an Honorable Mention. 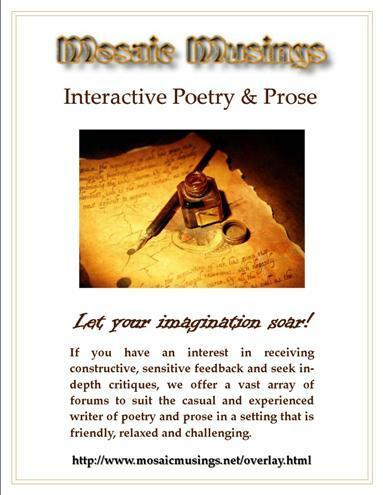 These will be eligible for publishing in the periodically released IBPC Anthology and at participating poetry boards. All rights remain with the author. This award will be added to the actual poem's threads nominated to represent MM. And this little guy is the mini-plaque for our nominated member's signature. Our 'former' Mod Choice plaque (since we no longer nominate for that award) will be used for any "IBPC Placements". It has a very similar look. Another thing I wanted to mention is BRAVO on the awards, I like both and think that is wonderful. 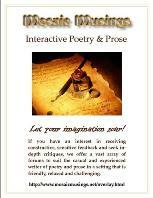 A poem going to IBPC would get one and any poem nominated would get the other. I love it! Appreciate further feedback on this one! a. The poem is currently being workshopped (the 'last post' date being recent). b. The poem has not been sent to IBPC previously by MM. 2. 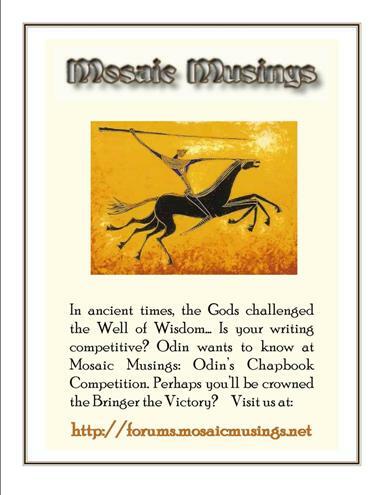 Please include the name of the forum the poem is posted in, within your nomination. I've just added #6 to the process and renumbered the remaining bullets. Once a member has accepted a nomination for that month's competition, any further poems nominated and accepted by that same member will be deferred to the following month. Updated process - participating boards mayu only submit TWO poems per month beginning in July, 2010.